Bike sharing has become increasingly prevalent over the past few years. As it continues to burgeon, the big question is whether this concept – specifically the dockless bike share – should be considered a threat or an opportunity. Getting bums on saddles has always been a priority for the industry, which has to compete against apathy, laziness, and prejudice against cyclists, as well as facing all manner of competition be it Xboxes, buses, cars, gyms, Netflix, iPhones, not to mention concerns about road danger, sore bums and helmet hair. Involving Generation X and millennials in cycling, therefore, has to be a fillip. 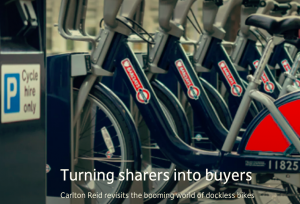 But in the share society – where mobility as a service has its own acronym (MaaS), the fact that people choose to ride bikes without owning one has to be cause for concern.